've got a never-ending stack of books that I work my way through, and every so often I try to see if I should not bother with some. I had picked up a book by Schlegel for a song that looked interesting a while back and I was just recently thinking of reading. Having just read a book that I was hoping to be more impressed with , I glanced over this fairly short work to try to estimate what the payoff might be. I wasn't convinced it was going to be worth my time, and found that I already had a review of it handy. Schlegel, Richard, Superposition and Interaction (1980) — A skimming of this book looks much better than the older work, but I've been unable to find any reviews of it. Because it's a fairly short work, I would simply just read it if I hadn't first read about the problems with the other book. 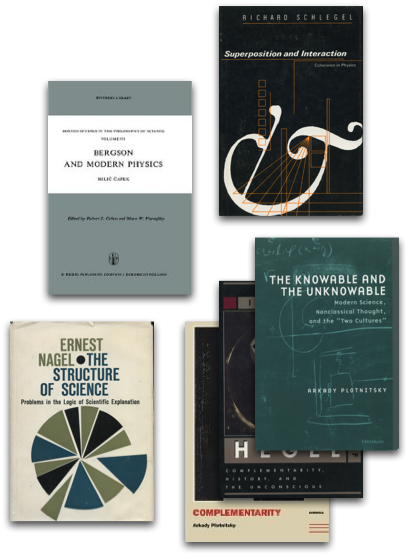 Plotnitsky, Arkady, In the Shadow of Hegel (1993), Complementarity (1994), The Knowable and the Unknowable (2002) — I share what I presume to be this author's interest in producing a philosophy of science that also is fluent in contemporary Continental philosophy in a no-nonsense, transparent way. I think there is a lot the two areas could contribute to one another, but it is also clear that there is a huge amount of crap out there by people only partially up to the task. I began to wonder where Plotnitsky's books sit, since they are all large enough to require a fair investment of time. He has certainly written a lot, so one hopes he has much to contribute. Nagel, Ernst, The Structure of Science (1960) — At over 600 pages, I'm curious to hear from others if this book is worth the time. Having read many works on scientific explanation post 1960, I worry this work will be too dated. While I do have a lengthy review here by Feyerabend , I would also be interested in hearing anyone's thoughts.